Not to be confused with Maranao people or Melanesians. When a Melanau child is about a month old its head is placed in a wooden device called Tadal, the object of which is to flatten the forehead and so make the face as near the shape of a full moon as possible. The pressure is applied only while the child is asleep. 1912. Melanau or A-Likou (meaning River people) are an ethnic group indigenous to Sarawak, Malaysia. They are among the earliest settlers of Sarawak. They speak in the Melanau language, which is part of North Bornean branch of Malayo-Polynesian languages. In 2010, there are estimated to be 123,410 who consider themselves Melanau, making it the fifth largest ethnic group in Sarawak (after Iban, Chinese, Malays and Bidayuh). Even though a minority in Sarawak, Melanau forms a large part of Sarawak's political sphere, 5 out of 6 of Yang di-Pertua Negeri of Sarawak is of Melanau ethnicity including the current Yang di-Pertua Tun Pehin Sri Abdul Taib Mahmud and 2 out of 5 of Chief Ministers of Sarawak are ethnic Melanau. 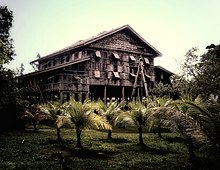 The traditional Melanau tall house. There are only few left standing in the world. In the 19th century, the Melanaus settled in scattered communities along the main tributaries of the Rajang River in Central Sarawak. Melanau or problematic Kajang speaking tribes such as the Sekapan, the Rajang, the Tanjung and the Kanowit gradually moved and assimilated into Dayak migrations settling in the Rajang. The Melanau people were regarded as a sub-group of the purported Klemantan people. Today the Punan (or Punan Bah) people are also closely linked to the last riverine dwelling Melanau communities previously inhabiting the middle and upper Rejang tributaries. The Kajang language is kept relatively alive by the isolated Sekapan communities Kapit division of Sarawak. The Melanau are considered among the earliest settlers in Sarawak. The name Melanau was not used by the Melanau to refer to themselves until recently. They call themselves a-likou meaning 'people of the river'. Legend has it that the name Melanau was given by the Malays of Brunei to the inhabitants of the coastal swamp flats and riverbanks of central Sarawak which might signifies "coast-dweller". Eda Green, writing in 1909, referred to "... the Milanes, whose girls are as fair as any Europeans and the belles of Borneo." The largest group is the Matu-Daro Each group has its own characteristic dialect, but they all share the same cultural and linguistic background. An exception is the Melanau Bintulu dialect, which can hardly be understood by speakers of other dialects and is thought by many linguists to hardly fit into the Melanau language grouping. This tribe is also known as "Vaie" whose language is very similar to Punan Lovuk Pandan and Punan Bah. Their early establishment were from Lavang and Segan riverine areas. Central, consists of dialects from Mukah-Oya, Balingian, Bruit, Dalat, Igan, Sarikei, Segahan, Prehan, Segalang, Siteng. Sibu, consists of dialects from Seduan and Banyok. Another Melanau group worth mentioning and inclusion is the Melanau Igan. They live in kampungs by the Igan River, e.g. Kampung Skrang, Kampung Tengah, Kampung Hilir, that border the Mukah - (Matu-Daro) district. The main language is Melanau. However some speak a local Malay dialect. This group of Melanau is probably all Muslim. They have mainly adopted Malay culture, while preserving some aspects of Melanau culture. It is believed that this group was originally Malays who settled in the area. However, intermarriage with Melanaus over many generations produced new generations who considered themselves Melanau. Similar to the Igan Melanaus ancestral beginnings, many Melanaus who had migrated to different areas in Sarawak experienced the same transformation. A group of Matu Melanaus settled in Bintawa area in Kuching after World War 2. However their offspring, even though mostly Melanaus by blood, normally do not speak the language. They are considered as Malays. However, as a point of interest, the new secondary school built in Bintawa Kuching in 2007 is named SMK Matu Baru. Many areas in Kuching notably Petra Jaya, Lundu and Santubong do have a significant Melanau population. Miri, Bintulu and Sibu are also places where there is a significant Melanau population. However the 'Bin' which mean "son of" and 'Binti', meaning "daughter of" factors in all their names (be they are Muslim, Christian or "Likou") had probably confused the census workers (read the following paragraph). One of the reasons the Muslim Melanau 'migrated' to become Malay is that during the registration of birth of the newborns, they will automatically being assumed as Malay if the parents don't inform the birth and death registration officer of their racial preference. Throughout history, places where the Melanaus traditional areas were described as either their local places such as Mukah, Igan etc or by the wider state or region name Malano. The earliest existence of a polity at the mouth o f the Rejang river is Kin-li-fo-che (shortened as Kin-fo) in Chinese records of I Ching which was already known in the 7th century. This Malanau empire covers North Borneo (Sabah), Sarawak and Brunei. JL Moens, mentioned of Fo-che-pou-lo as to be located at the same location. On Mercator map of 1587 also locates the chief ports on the west coast of Borneo (Brunei) Malano and Puchavarao (Fo-che-pou-lo). “Xiao Dong Yang's territory under the power of Fu Ni state includes Ma Li Lu (Manila), Ma Ye (Luzon), Mei Kun, Pu Duan (Panay), Su Lu (Sulu), Sha Hu Zhong (Marudu), Ya Chen (Igan), Odjuton (Tutong) and Wen Du Ling (Bintulu)." "Kadandangan, Landa Samadang dan Tirem tak terlupakan, Sedu, Barune (ng), Kalka, Saludung, Solot dan juga Pasir, Barito, Sawaku, Tabalung, ikut juga Tanjung Kutei, Malano tetap yang terpenting di pulau Tanjungpura." Following Hayam Wuruk's death in 1389, Majapahit power entered a period of decline with conflict over succession. This window of opportunity gives local kingdoms to flourish. Syair Awang Semaun which tells the establishment of the Brunei Kingdom is an epic poem passed down from generations. There are many versions of the manuscripts of at least 6 believed to be written into manuscipt in 19th century. The poem mentions the conquest of 14 brothers to establish a kingdom and their territorial expansion begins with conquering the Melanau areas which was under the power of Tugau and his allies covering from Sambas to Hulu Sungai Brunei. It is estimated that around 1730, under Sultan Kamaluddin of Brunei regained control over the countries from Sarawak Proper from Sambas including the Melanau areas. "It is evident, from the remains of the deserted towns and villages that we saw in their districts, that the population was formerly much greaterthan we found it during our expeditions to protect their industrious people. We heard of almost monthly attacks on one or other of their villages, and a few weeks passed without the Milanows having to add many to the list of their murdered relatives." Finally in 1861, the Sultan gave lease to James Brooke the territories between Samarahan river to Tanjung Kidurong. Since the 14th century, the Melanaus have never been united under their own racial political entity and controlled by Brunei for about 500 years and the White Rajahs for about 100 years. This contributes to the disparity in the language differences among the Melanaus that widespread along the coastline of North west Borneo. The Melanau were traditionally fishermen as well as padi and sago farmers. Some were skilled boat builders. They used to live in tall stilt and long houses, but nowadays, they live in Malaysian kampung-style houses (individual & separated houses). Because of religious similarity, the majority of Melanaus live socially and culturally like the rest of the Malays in Malaysia. The Melanau are one of the rare ethnic groups in Malaysia to have a population that remains more or less constant in numbers. This is because the Muslim Melanaus that have migrated to bigger towns in Sarawak have "automatically" become "Malays" especially during the National Census Operation as their names (and many times the language the elders use with their children at homes) are indistinguishable from those of the local Sarawak Malays. This has helped the Malay population of Sarawak to have significantly increased in the census. Most Melanaus have a 'Bin' (son of) and 'Binti' (daughter of) in their names similar to the Malays and it is also likely that the Christian Melanaus too were designated as Malays in the census. The 2010 Malaysian Population Census showed the Melanaus population in Sarawak, Malaysia was about 123,410. They make up the 5th largest ethnic group in Sarawak, after the Ibans, Chinese, Malays and Bidayuh. The continuous inter-marriage between the Melanau and other races in Malaysia has also caused the disappearance of the Melanau identity. Data from some private research estimated that the actual Melanau population (in Malaysia and outside Malaysia) is much higher. Being migrants in the early days, Melanaus are found almost everywhere in Sarawak. Sadly, though their children know their roots, many of them cannot speak or even understand their Melanau language. Intentionally or unintentionally, many of them have registered themselves as other races, mostly as Malays. In some cases, their parents, both Melanaus, prefer to speak Malay or English to their children. This language trend is mainly found in the towns and cities in Sarawak. There have been little efforts done to preserve the Melanau dialects and to teach the current Melanau generation continuous usage of their own dialects. The gradual disappearance of the Melanau cultures and dialects is further aggravated by the absence of qualified Melanau staff members handling the documentation on the Melanau culture and history in the 'Majlis Adat Istiadat' department in Sarawak. This department is involved in the preservation and documentation of the cultures and histories of the various ethnic groups in Sarawak. The Melanau are slowly being absorbed into other cultural groups. The Melanau Kaul festival will only serve as a reminder of the Melanau Pagan ritual. While originally animists, the majority of the Melanaus are now Muslim, although some of them, especially among the Melanau Mukah, and Dalat are Christian. Nonetheless, many still celebrate traditional rites such as the annual Kaul Festival. Despite their different beliefs and religions, the Melanaus, like other East Malaysians (Sabah and Sarawak) are very tolerant of each other and are proud of their tolerance. One can still come across a Melanau family with different children in the family embracing Christianity and Islam while their parents still have strong animist beliefs. The Melanau have their own calendar which begins in March. The New Year is celebrated during the Kaul Festival. ^ Charles Hose; William Mcdougall (2015). Borneo Shamanism. Charles Hose. ISBN 605-176-617-0. ^ "Melanau - Orientation". Retrieved 12 August 2014. ^ Eda Green (1909). "Borneo: The Land of River and Palm". Project Canterbury. Retrieved 26 August 2008. ^ Banks, E. (1947). "Ancient Times in Borneo". Journal of the Malayan Branch of the Royal Asiatic Society. 20 (2 (142)): 26–34. JSTOR 41560024. ^ "Kesultanan Melayu Brunei dalam Konflik Mukah pada Abad ke-19: Satu Perbandingan antara Perspektif Sumber Barat dan Tempatan". ^ a b Ansovina Chai (16 October 2017). "Melanau delicacies to enjoy". The Star. Retrieved 13 September 2018. ^ a b Zora Chan (23 March 2014). "Umai among Mukah's best known delectable and affordable dishes". The Star. Retrieved 13 September 2018. ^ Georgette Tan (26 August 2018). "Makan Makan Sarawak highlights similarities". The Borneo Post. Retrieved 13 September 2018. 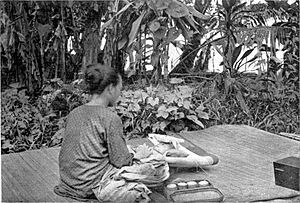 Wikimedia Commons has media related to Melanau people.